Text: The stage on which the Eidophusikon was represented, was little more than six feet wide, and about eight feet in depth; yet such was the painter’s knowledge of effect and scientific arrangement, and the scenes which he described were so completely illusive, that the space appeared to recede for many miles, and his horizon seemed as palpably distant from the eye, as the extreme termination of the view would appear in nature. The opening subject of the Eidophusikon represented the view from the summit of One-tree Hill, in Greenwich Park, looking up the Thames to the Metropolis; on one side, conspicuous upon its picturesque eminence, stood Flamstead House; and below, on the right, the grand mass of building, Greenwich Hospital, with its imposing cupolas, cut out of pasteboard, and painted with architectural correctness. The large groups of trees formed another division, behind which were the towns of Greenwich and Deptford, with the shore on each side stretching to the metropolis, which was seen in its vast extent, from Chelsea to Poplar. Behind were the hills of Hampstead, Highgate, and Harrow; and the intermediate space was occupied by the flat stage, as the pool or port of London, crowded with shipping, each mass of which being cut out in pasteboard, and receding in size by the perspective of their distance. The heathy appearance of the fore-ground was constructed of cork, broken into the rugged and picturesque forms of a sand-pit, covered with minute mosses and lichens, producing a captivating effect, amounting indeed to reality. This scene, on the rising of the curtain, was enveloped in that mysterious light which is the precursor of day-break, so true to nature, that the imagination of the spectator sniffed the sweet breath of morn. A faint light appeared along the horizon; the scene assumed a vapourish tint of grey; presently a gleam of saffron, changing to the pure varieties that tinge the fleecy clouds that pass away in morning mist; the picture brightened by degrees; the sun appeared, gilding the tops of the trees and the projections of the lofty buildings, and burnishing the vanes on the cupolas; when the whole scene burst upon the eye in the gorgeous splendour of a beauteous day. The clouds in every scene had a natural motion, and they were painted in semi-transparent colours, so that they not only received light in front, but, by a greater intensity of the argand lamps, were susceptible of being illuminated from behind. The linen on which they were painted was stretched on frames of twenty times the surface of the stage, which rose diagonally by a winding machine. De Loutherbourg, who excelled in representing the phenomena of clouds, may be said to have designed a series of effects on the same frame; thus, the first gleam of morn led to the succeeding increase of light; and the motion being oblique, the clouds first appeared from beneath the horizon, rose to a meridian, and floated fast or slow, according to their supposed density, or the power of the wind. To illuminate the interesting scenes for this display of nature, the ingenious projector had constructed his lights to throw their power in front of the scenes; and this plan might be tried with advantage for spectacles, and particular effects at least, on the great stages of our magnificent theatres. The lamps on De Loutherbourg’s stage were above the proscenium, and hidden from the audience, instead of being unnaturally placed as we are accustomed to see them, by which the faces of the performers are illuminated, like Michael Angelo’s Satan, from the regions below; thus throwing on their countenances a preternatural character, in defiance of all their well studied science of facial passion and expression. What painter ever dreamt of inverting the order of nature so entirely as to light the human countenance upwards? And why depart so strangely from truth upon the stage? The expression would be increased tenfold by lighting from above the proscenium. — For how infinitely more impressive is the emotion of the passions, when described with the spacious orbit of the eye in that deep shadow which the grand gusto of the historic style of painting has adopted — the majesty of intellectual intelligence is seen to rest upon the human brow. Nothing can outrage truth, or do so much violence to that delicate expression, which is the soul of acting, when addressed to the philosophical mind, as to view the bold projection of the chin, the subordinate and characteristic prominence of the nose, the upper part of the orbits of the eyes, instead of forming harmonious shadows, glaring in the blaze of stage-lamps, each a separate touch of light. 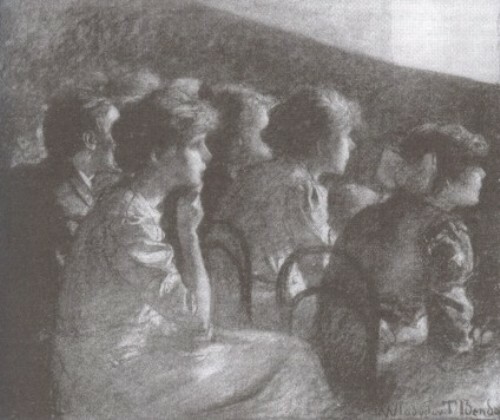 Were the other method adopted for illuminating the stage, the scenes would recede, in their respective distances; the front and most prominent characters would cast a shadow on those in the second ground, and the general effect would assume the superior light and shadow of nature in manifold combinations, such as we behold on the historical groups of the great masters. Why should we continue to tolerate absurdities upon the stage, to the manifest injustice of those fine and masterly traits, as exhibited in the actor’s “anatomy of expression?” which might, but for this, serve as a school for the painter to study the rudiments of rage, anger, terror, guilt, jealousy, and other potent passions operating on the human visage, with that marked expression which the science of certain great actors can personate at will. Before the line of brilliant lamps, on the stage of the Eidophusikon, were slips of stained glass; yellow, red, green, purple, and blue: by the shifting of which, the painter could throw a tint upon the scenery, compatible with the time of day which he represented, and by a single slip, or their combinations, could produce a magical effect; thus giving a general hue of cheerfulness, sublimity, or awfulness, subservient to the phenomena of his scene. This too might be adopted on the regular stage, were the ingenious machinists of the scene-room to set their wits to work; and at no vast expence, since the improvements of lighting with gas. Gainsborough was so wrapt in delight with the Eidophusikon, that for a time he thought of nothing else — he talked of nothing else — and passed his evenings at that exhibition in long succession. Gainsborough, himself a great experimentalist, could not fail to admire scenes wrought to such perfection by the aid of so many collateral inventions. Loutherbourg’s genius was as prolific in imitations of nature to astonish the ear, as to charm the sight. He introduced a new art — the picturesque of sound. De Loutherbourg had tried many schemes to effect this; but none were satisfactory to his nice ear, until he caused a large skin to be dressed into parchment, which was fastened by screws to a circular frame, forming a vast tambourine; to this was attached a compact sponge that went upon a whalebone spring; which,s truck with violence, gave the effect of a near explosion; a more gentle blow, that of a far-off gun; and the reverberation of the sponge produced a marvellous imitation of the echo from to cloud, dying away into silence. The thunder was no less natural, and infinitely grand: a spacious sheet of thin copper was suspended by a chain, which, shaken by one of the lower corners, produced the distant rumbling, seemingly below the horizon; and as the clouds rolled on, approached nearer and nearer, increasing peal by peal, until, following rapidly the lightning’s zig-zag flash, which was admirably vivid and sudden, it burst in a tremendous crash immediately over-head. Once, being at the Eidophusikon, with a party of intelligent friends, when this scene was performing over Exeter ‘Change, I had the felicity to experience a most interesting treat. I had often wished for an opportunity to compare the effect of the awful phenomenon — a thunder storm, with this imitative thunder of De Loutherbourg’s. A lady exclaimed, “It lightens!” and, in great agitation, pointed to an aperture that admitted air to the upper seats. The consternation caused by this discovery, induced many to retire to the lobby, some of whom, moved by terror or superstition, observed, “that the exhibition was presumptuous.” We moved to the gallery, and opening a door, stood upon the landing place, where we could compare the real with the artificial storm. When the exhibition was over, and were tired to sup with one of our party, the worthy James Christie, in Pall Mall, we naturally went into the merits of this scenic display; when it was sagely determined, that man was an extraordinary creature, who could create a copy of Nature, to be taken for Nature’s self. But the most impressive scene, which formed the finale of the exhibition, was that representing the region of the fallen angels, with Satan arraying his troops on the banks of the Fiery Lake, and the rising of the Palace of Pandaemonium, as described by the pen of Milton. De Loutherbourg had already displayed his graphic powers in his scenes of fire, upon a great scale, at the public theatre — scenes which had astonished and terified [sic] the audience; but in this he astonished himself, — for he had not conceived the power of light that might be thrown upon a scenic display, until he made the experiment on his own circumscribed stage. Here, in the foreground of a vista, stretching an immeasurable length between mountains, ignited from their bases to their lofty summits, with many-coloured flame, a chaotic mass rose in dark majesty, which gradually assumed form until it stood, the interior of a vast temple of gorgeous architecture, bright as molten brass, seemingly composed of unconsuming and unquenchable fire. In this tremendous scene, the effect of coloured glasses before the lamps was fully displayed; which, being hidden from the audience, threw their whole influence upon the scene, as it rapidly changed, now to a sulphurous blue, then to a lurid red, and then again to a pale vivid light, and ultimately to a mysterious combination of the glasses, such as a bright furnace exhibits, in fusing various metals. The sounds which accompanied the wondrous picture, struck the astonished ear of the spectator as no less preternatural; for, to add a more awful character to peals of thunder, and the accompaniments of all the hollow machinery that hurled balls and stones with indescribable rumbling and noise, an expert assistant swept his thumb over the surface of the tambourine, which produced a variety of groans, that struck the imagination as issuing from infernal spirits. Such was De Loutherbourg’s Eidophusikon; and would that it were in being now, when the love of the fine arts has spread in so vast a degree! — that knowledge which would have appreciated its merits having increased a thousand-fold, since the period when the greatest scene-painter in the world was induced to dispose of his wondrous little stage, because the age could not produce amateurs sufficient, after two seasons, to muster an audience to pay for lighting his theatre! Comments: William Henry Pyne (1769-1843) was a British writer, painter and illustrator, who wrote under the pseudonym Ephraim Hardcastle. The Eidophusikon was the invention of Franco-British artist and scenery designer Philip James de Loutherbourg (1740-1812). It was a form of mechanical theatre, showing landscape pictures whose visual features changed through a system of pulleys, mirrors, coloured glass, with sound effects, though the exact mechanics are not known. There were three versions. The first was exhibited at De Loutherbourg’s home in Lisle Street, Leicester Square, London February-May 1781. The second, with additional scenes introduced, including the ‘Pandaemonium’ sequence, was exhibited January 1872 to some time in 1873. The third, that witnessed by Pyne, opened at Exeter Change on the Strand, London, in 1786. The venture was not a financial success, partly because De Loutherbourg could not keep up with audience demand for new scenes. The invention and its artworks do not survive. This entry was posted in 1780s, Memoirs, United Kingdom and tagged Artists, Audience, Eidophusikon, Fear, Lighting, London, Projection, Sound effects, W.H. Pyne. Bookmark the permalink. This is WONDERFUL! It is an incredibly helpful explanation of how the Eidophusikon worked. Thank you so much for posting this!!!! Glad to be of service. The chapter was a bit too long to give in full, but if you check the Hathi Trust link you’ll find the whole thing, with more descriptions of the effects. It shows a remarkable feat of memory on Pyne’s part, and makes you appreciate what a powerful impact the Eidophusikon clearly had. This is a fabulous description of the Eidophusikon, and a marvellous post. 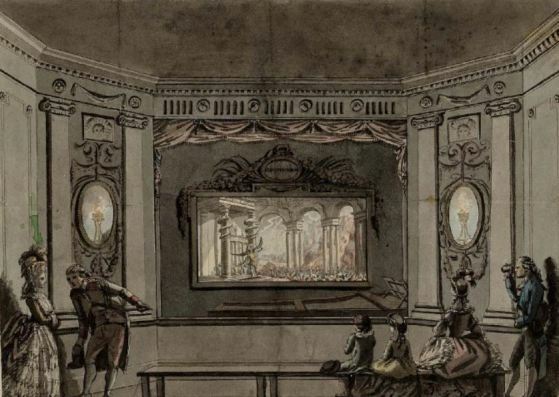 Readers interested in de Loutherbourg and his invention might want to seek out some good modern research in Christopher Baugh’s article “Philippe de Loutherbourg: Technology-Driven Entertainment and Spectacle in the Late Eighteenth Century”, in Huntington Library Quarterly, Vol. 70 (2007) No. 2, pp. 251 – 268, available through JSTOR and elsewhere. Baugh is particularly good on Loutherbourg’s work as an innovative set designer at the Drury Lane Theatre, as well as covering the Eidophusikon in detail. Loutherbourg’s home, where the spectacle was first shown, could evidently accommodate some 130 persons at a single viewing. This is wonderful, thank you for it. I am about to lead a candlelit attempt at this art in a local chapel in Suffolk, UK, on Saturday. I teach lighting history, so the lighting will change and the sea will glow. We are having live music and the whole afternoon will be non-electric. Anyone interested in coming along or seeing the resulting video or images, please reply. I’m delighted to hear about your recreation of this art. I hope it goes well. If you are going to have a link to images or video, do let me know.